Those familiar with Emilie & Ogden and their stunning debut record, last year's 10,000, will know that Ogden is the name of Emilie Kahn's harp. The name of the project puts performer and instrument on equal footing, but the record itself swings more directly in favour of the former's voice, and the latter is sometimes outdone by washes of banjo, percussion, brass and other arrangements. 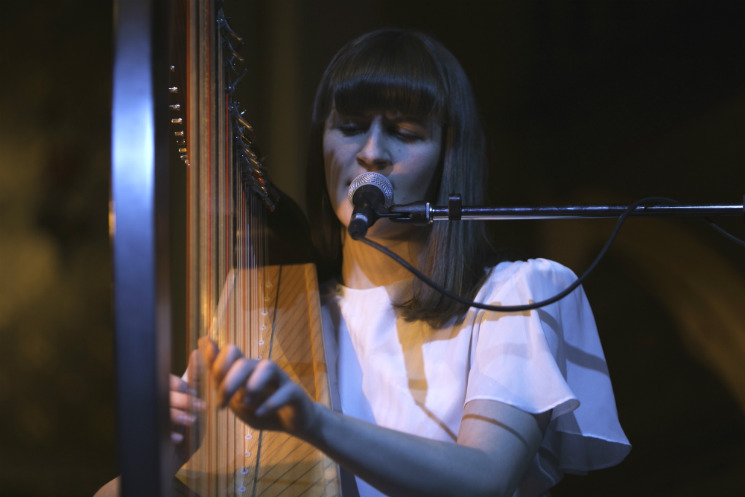 So it was a bit of a relief to see Kahn perform on Tuesday night (February 2) with no backing band, just her and her harp. Cast in the light of a fixture shaped like a birdcage, there was something incredibly riveting about hearing their melodies unfold unencumbered. The acoustics of the church both served the performer and worked against her, as commotion from the bar at the back of the venue battled with her sound (music journalist and author Jessica Hopper had a similar problem at the beginning of the night, having to contend with that and someone's ringing phone during her keynote address). When left uninterrupted though, the delicate, ornate qualities of Emilie & Ogden felt right at home juxtaposed with the intricate beauty of St. Alban's Church.